Hardwood, tile, and natural stone floors are the most popular in flooring choices right now. Many people have come to believe that hard surface flooring is easier to take care of and that they stand up to stains and accidents better than another flooring. Truth is, it depends on the type of stain and the type of floors you have. Natural stone is a beautiful and sturdy flooring choice, but it is not indestructible especially where pet stains are concerned. One of the harshest things for a stone floor to stand up to is pet urine. Urine is the only natural substance that changes from an acid state into an alkaline. When urine first leaves the body it has a pH of about 5 or 6 which is slightly on the acidic side. As urine dries, it becomes an alkaline salt with a new pH of about 10 to 12, making a very strong alkaline. That is quiet the chemical change. For this reason, any flooring or furniture that becomes victim to a urine stain needs immediate care and attention. The dry alkaline salts are hydrophilic meaning that they absorb moisture out of the air. The longer it sits and the more moisture it absorbs the larger the odor it creates. The urine stain is creating a foul odor as well as etching the stone surface and eventually will absorb into the pours in the stone causing degradation the longer it sits. If you have a soft stone floor like travertine, it will etch very easily. This is because of the calcium carbonate that soft stones contain making them more vulnerable to acidic substances including pet urine, coffee, tea, all citrus, etc. 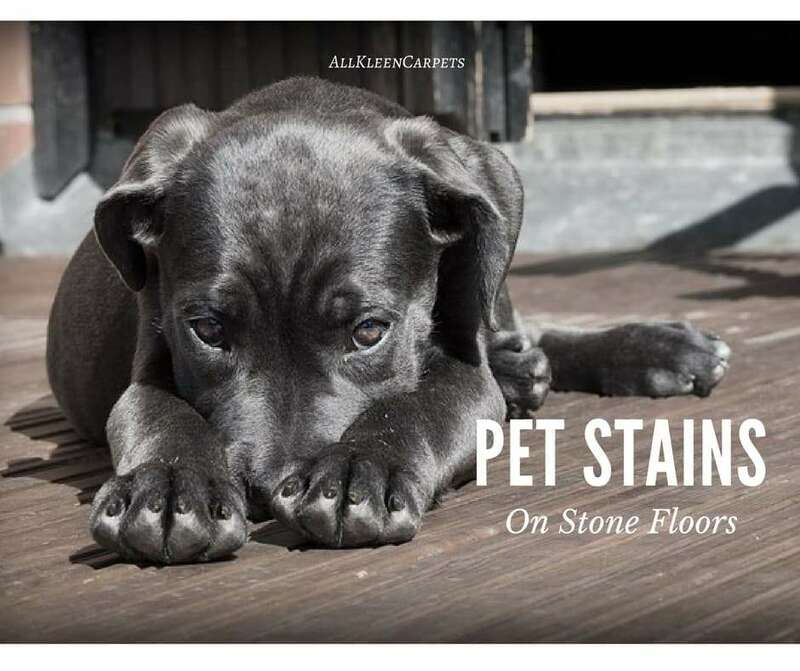 Pet urine is one of the toughest acidic stains to clean from stone because it can cause more damage to the floor in the process of removing it as it turns alkaline and salty. Using a cleaner with a high alkaline content to try and clean it you could dull the stone further. You don’t want to clean an alkaline stain with an alkaline cleaner. Your best defense against pet stains on stone flooring is a professional stone sealing. Prior to sealing, you will want to have your stone professionally cleaned to ensure it is in top shape. Once the stone floor is deep cleaned and sealed, you will want to care for it with a pH neutral cleaner made for stone flooring. When an accident happens the best key to a successful cleanup is to get to it quickly. Grab a white towel or paper towel to blot up the mess and then gently apply dish soap to the area. Rinse the soap with water, making sure to blot with your towel during the process and not rub to avoid scratching and etching the surface of the stone. Blotting also helps to prevent the stain from spreading to a larger area. If the stain has absorbed into the stone call in a professional tile and stone cleaner right away. The longer you leave a pet stain the more likely permanent damage of your stone floor will occur. Once the urine stain is cleaned make sure to de-odorize the area to help discourage your pet from urinating there again. When an animal can smell their scent on the area it sends a signal that this is “their territory” and it is ok to use this spot again to relieve themselves. All Kleen can help you remove the toughest pet stains and odors from carpet, tile, and upholstery. Make an appointment online or give us a call as soon as you notice a difficult stain.